The Coffeyville Red Ravens were back on the hardwood last night as both women's and men's teams hosted the Garden City Broncbusters. This was their final game on the home court for 2018 before they head to break as the ladies entered the game at 1 and 11, the men quite the opposite at 11 and 1 on the year and #3 in the national rankings. The ladies tipped off first and from the start could not find a leader on the offensive side. Having a lack of veteran presence definitely affected the ladies last night, though they played very hard defensively forcing 28 turnovers, though they only scored 10 points off that. Shooting 25% from the floor 27% from 3 and only 63 percent from the line. The ladies take a tough home loss 58 to 47 proving again they can compete with anyone defensively, just struggle to hit shots. The guys played right after as they welcomed the 6 and 6 Bronc Busters on to Jay Herkelman Court at Nellis Hall. A team that usually likes to drive and run with the basketball came out and surprised everyone shooting great from the floor keeping things interesting after one half with the score at 46 to 38. When the second half came around, CCC’s strengths really showed as they shot incredible from the floor finishing 63% from the floor, 55% from three point land and 61% from the line. They had 4 players on double digits with sophomore Marvin Johnson leading the way with 18 points, 4 rebounds and 5 assists. Red Ravens get their 12th win on the year moving to 12 and 1 and still unbeaten in conference play as they beat Garden City 92 to 71, moving coach Herk just 7 games away from breaking Francis Flax’s record of most wins as a coach in Region VI. 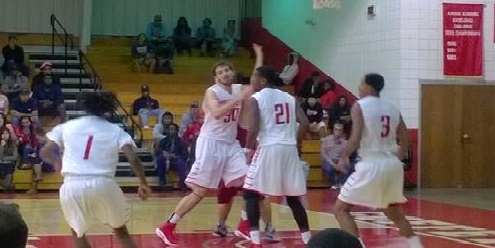 The Coffeyville Community College Red Ravens basketball teams split a double header at Pratt Community College Saturday afternoon. The Red Raven men easily handled Pratt winning by 19. The final score was the Red Ravens 75 Pratt 56. The win gives the 4th ranked Raven Men an 11 – 1 overall record. Meanwhile the Lady Ravens fell to 1 – 11 after falling to Pratt in Saturday’s first game by a final score of 74 – 54. Both the Men and Women return home Wednesday night when they take on Garden City at Nellis Hall. Wednesday night’s game can be heard live on KUSN 98.1FM and viewed via a stream at kggfradio.com.